Today’s guest on the podcast is Luvvie Ajayi, writer, activist, digital strategist, speaker and superb side-eye artist. Luvvie has been blogging for over 12 years and her blog AwesomelyLuvvie.com cracks me up every time I open it. Luvvie also co-founded The Red Pump Project, a nonprofit organization that raises awareness about the impact of HIV/AIDS on women and girls. You can read more about Luvvie on her about page, but basically she writes for tons of great websites, speaks at all kinds of wonderful events, and does a lot of good in this world. 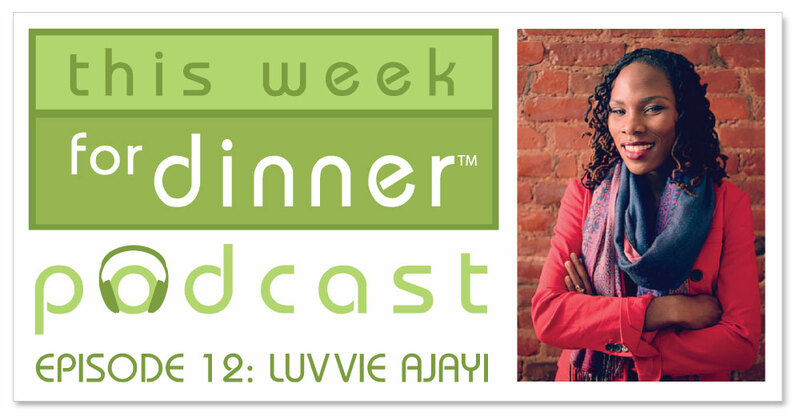 We love Luvvie! Dear Everyone Else: Tweet Luvvie if you have a minute and tell her mom we want her to write a cookbook! Okay, here are a few good options for the suction cup sponge “thingy.” Option 1: Basket style (comes in several metal finishes). Option 2: Solid aluminum style (more modern looking). Option 3 (like Luvvie’s): Plastic style. Fun episode! I have one of those suction cup sponge thingies and it’s perfect. And I’m with ya – sponges all the way. Luvvie’s organization sounds great. Looking forward to reading more about that.